Identification: Williams (1975); Page (1983); Page and Burr (1991; as Etheostoma bifascia); Mettee et al. (1996). Native Range: Gulf Slope drainages from Choctawhatchee River west to Perdido River, southern Alabama and Florida panhandle (Williams 1975). Table 1. States with nonindigenous occurrences, the earliest and latest observations in each state, and the tally and names of HUCs with observations†. Names and dates are hyperlinked to their relevant specimen records. The list of references for all nonindigenous occurrences of Ammocrypta bifascia are found here. Ecology: Inhabits streams with sandy bottoms and moderate to swift currents (Williams 1975). Spawning occurs from April-August, with maturity reached by 38 (females) to 43 (males) mm SL (Williams 1975; Heins 1985). Maximum life span of approximately 3 years (Heins 1985). Means of Introduction: The introduction of the Florida Sand Darter was most likely via a bait bucket (Gilbert and J. D. Williams, unpublished data). While this highly translucent darter may not be used for bait, it easily may have been taken as by-catch by anglers seining for bait. It is common in streams of the Choctawhatchee River drainage, just west of the Apalachicola River, and anyone seining for bait minnows in streams with sandy bottom pools may have captured Florida Sand Darters. Status: Established in Florida. Many more collections of Florida Sand Darter have been reported since the original two reports. The species is now thought to be fairly common in the Apalachicola River (Gilbert and J. D. Williams, personal communication). Remarks: Starnes and Starnes (1979) concluded that the species' presence in the Apalachicola was a natural occurrence and resulted from coastal dispersal. They argued against the possibility of a bait-bucket release because the two known collections were temporally and geographically separated. However, there are several reasons to support the idea that the Florida Sand Darter's occurrence in this area resulted from human introduction. The species had never been taken during the many fish samplings conducted in the Apalachicola prior to 1974. The species is known to occur naturally west of the Apalachicola in the upstream reaches of streams draining the upper Coastal Plain. Its absence in the Chattahoochee and Flint rivers in Alabama and Georgia, two upstream tributaries of the Apalachicola River, tends to support a recent introduction. Voucher specimens: Florida (UF 24415, 73263, 175939; TU 170664, 170734). Heins, D.C. 1985. 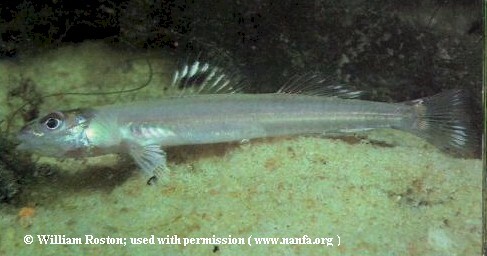 Life history traits of the Florida sand darter Ammocrypta bifascia, and comparisons with the naked sand darter Ammocrypta beani. American Midland Naturalist 113(2):209-216. Page, L.M. 1983. Handbook of darters. T.F.H. Publications, Inc., Neptune City, NJ. Page, L.M., and B.M. Burr. 1991. A field guide to the freshwater fishes of North America north of Mexico. The Peterson Guide Series, vol. 42. Houghton Mifflin Company, Boston, MA. Starnes, W.C., and L.B. Starnes. 1979. Discovery of the percid genus Ammocrypta (Pisces) in the Apalachicola drainage, Florida. Florida Scientist 42(1):61-62. Swift, C.C., C.R. Gilbert, S.A. Bortone, G.H. Burgess, and R.W. Yerger. 1986. Zoogeography of the fishes of the southeastern United States: Savannah River to Lake Pontchartrain. 213-266 in C.H. Hocutt and E.O. Wiley, eds. The zoogeography of North American freshwater fishes. John Wiley and Sons, New York, NY. Williams, J.D. 1975. Systematics of the percid fishes of the subgenus Ammocrypta, genus Ammocrypta, with descriptions of two new species. Bulletin of the Alabama Museum of Natural History 1:1-56.